[Review] Asus Q304UA-BBI5T10 now that's what we're talking about! Homeasus laptop[Review] Asus Q304UA-BBI5T10 now that's what we're talking about! In the wake of tablets, a trend that began with the iPad and has proven to give PC manufacturers lots of headaches, both Microsoft and those manufacturers have evolved their products to meet those new demands. Specifically, Windows 10 and hardware, respectively. In this case we have an offering from Asus. This is the review of the Asus Q304UA-BBI5T10, a so called “2-in-1” that promises the performance of a fully fledged computer that also happens to be convertible and turn not only into a tablet, but a standing display as well, all this wrapped up with a very competitive price tag. Pros: powerful Intel core i5, USB Type-C, Full HD display, backlit keyboard, 3.3 pounds. 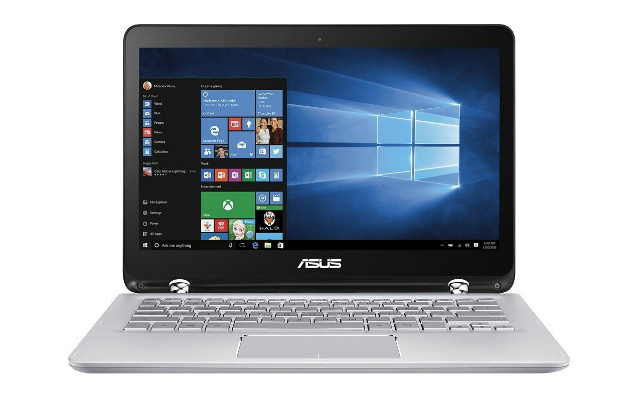 Let’s get the basics first: the Asus Q304UA-BBI5T10 is a 13.3 inch convertible laptop with the company’s signature silver body and design. A distinctive thing stands out, however: the two hinges have a very particular chromed design, and the company advertises them as special, being able to flip the laptop at any angle from 0 to 360 degrees. The screen is great thanks to its 1080p resolution, which will offer crisp images for both desktop work and things like watching movies, especially on a tablet session when holding the screen closer. We should also point out that this laptop is very light, weighing in just 3.3 pounds. That said, though we know that the 13 inch form factor isn't the most convenient as far as convertibles go, it's still a lot better than a 15 inch convertible when it comes down to portability. As far as the keyboard goes, there's no numeric pad but we should point out that it boosts a backlit keyboard, something that many people have come to appreciate when dealing with high end laptops such as this one. Asus chose an Intel Core i5-6200U processor for the Q304UA-BBI5T10. This is a high mid-range chip that works with two cores clocked at 2.3 GHz (2.8 GHz with Turbo Boost) and offers amazing performance as well as great power consumption thanks to its low-voltage profile. Based on that, we can say in the review of the Asus Q304UA-BBI5T10 that this machine will behave with even demanding applications for specific work like editing and creation tools. Simpler tasks like web browsing, office work and multimedia playback will go without a hitch. On the multitasking corner we find 6GB of RAM (DDR3, 1600 Mhz) included. Though a bit less than some models, it’s still better than the 4 GB some models get, and besides, it’s expandable up to 12 GB, well beyond the standard and more than enough for the most intensive multitaskers. As expected with laptops with integrated graphics, modern blockbuster games will not run very good. The Intel HD Graphics 520 present here is capable of running some of those, but always on low settings. It’s worth noting, though, that older titles as well as new ones with low requirements will work with medium settings. The Sims 4, Counter Strike and Undertale are great examples. Gaming is an option, just not what this laptop is made for. Asus includes a 3-Cell battery with the Asus Q304UA-BBI5T10 and claims increased battery life over smart decisions over the components used, as well as some features like auto-backing when battery reaches 5% and being able to charge it three times more than usual. In terms of raw batter life, the company claims up to 10 hours of battery life which is pretty great even if we lower our expectations towards a more "realistic" 8 hours with moderate to intensive usage. All in all, it's well positioned within the high end of battery life. Connectivity with the Asus Q304UA-BBI5T10 is pleasantly above average. First we have two full USB 3.0 ports and, not only that, there’s also an USB 3.1 and Type-C, which means newer, more convenient and faster. Finally, we always love the inclusion of an HDMI port thanks to the versatility it offers. Audio and MicroSD card reader are present too. Finally, on the storage department we stumble with upon a 1TB mechanical hard drive (5400 RPM). This is not what we would have chosen, but you still can’t beat the raw 1 TB spec, so go crazy on storing everything you want. After the review of the Asus Q304UA-BBI5T10 we find a powerful, full-fledged laptop that also happens to double as a tablet and a screen for some surfaces. That’s thanks to its 6th generation Core i5 processor, 1080p display, lightweight design and USB Type-C we're looking at a high-range convertible without a doubt. Some use to pass on convertibles, but with systems like this it’s easy to see why they are such a popular category. If you happen to be looking for a laptop, a tablet and maybe even a small multimedia center, you might want to look at this all-in-one package. You can check pricing and availability here! This is a great review. I couldn't find much on this computer besides what was on Best Buy's site, and that's understandable because it is a "Blue-label" laptop and exclusive to them, as far as I know. I decided to take a chance on it and I couldn't be happier. I did have to exchange it twice, the first time because of 5 dead/stuck pixels and the second time because of a bad hard drive out of the box, but the one I've got now runs like a champ and I couldn't be more impressed. I love this computer, and I was worried about going down from the 15.6 inch screen of my last two laptops, but the drop in screen size hasn't affected me much because you can adjust the scaling of the screen in the options and I actually much prefer the portability. The build quality is great, not a surprise from ASUS, and the screen is gorgeous. Everything functions great! I highly recommend this set. Very portable, powerful, and just all around a joy to use.